Feruz joins Dylan McGeouch and Rhys McCabe in winning places in squad for friendly with Italy. 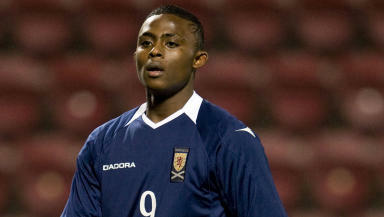 Islam Feruz has been named in Scotland's Under-21 side for the forthcoming friendly with Italy. The 16-year-old Chelsea forward has been fast-tracked to Billy Stark's team, having impressed since his move to London from Celtic in the summer. Feruz has appeared regularly for the English Premier League side's Under-18s squad, while also featuring on occasion for the reserve side. Celtic's Dylan McGeouch, who featured as a substitute in his team's Scottish Cup semi-final defeat to Hearts at the weekend, and Rangers midfielder Rhys McCabe have also won call-ups. Dundee United trio Stuart Armstrong, Johnny Russell and Gary Mackay-Steven are also in the selection, as is Liverpool defender Danny Wilson. Huddersfield Town striker Jordan Rhodes has been rested. Scotland will play Italy at Easter Road on Wednesday, April 25 with a 7pm kick-off. **Goalkeepers: **Grant Adam (Rangers), Matthew Edwards (Rochdale), Mark Ridgers (Hearts). **Defenders: **Paul Hanlon (Hibernian), Ryan Jack (Aberdeen), Ross Perry (Rangers), Clark Robertson (Aberdeen), Lewis Toshney (Celtic), Danny Wilson (Liverpool). **Midfielders: **Scott Allan (West Bromwich Albion), Stuart Armstrong (Dundee United), Liam Kelly (Kilmarnock), Rhys McCabe (Rangers), Dylan McGeouch (Celtic), Kenny McLean (St Mirren), Liam Palmer (Sheffield Wednesday), David Wotherspoon (Hibernian). **Forwards: **Islam Feruz (Chelsea), Alex MacDonald (Burnley), Gary Mackay-Steven (Dundee United), Michael O'Halloran (Bolton), Johnny Russell (Dundee United).